On March 10, 2019, our beloved child life specialist Jayne Kamau died aboard Ethiopian Airlines flight ET302 as she returned home from the SIOP Africa conference in Cairo. WE C Hope Child Life Director, Morgan Livingstone, reflects on more than a decade of mentoring, friendship and working together to advance child life in Kenya. Co-authored with Abby White, WE C Hope CEO. 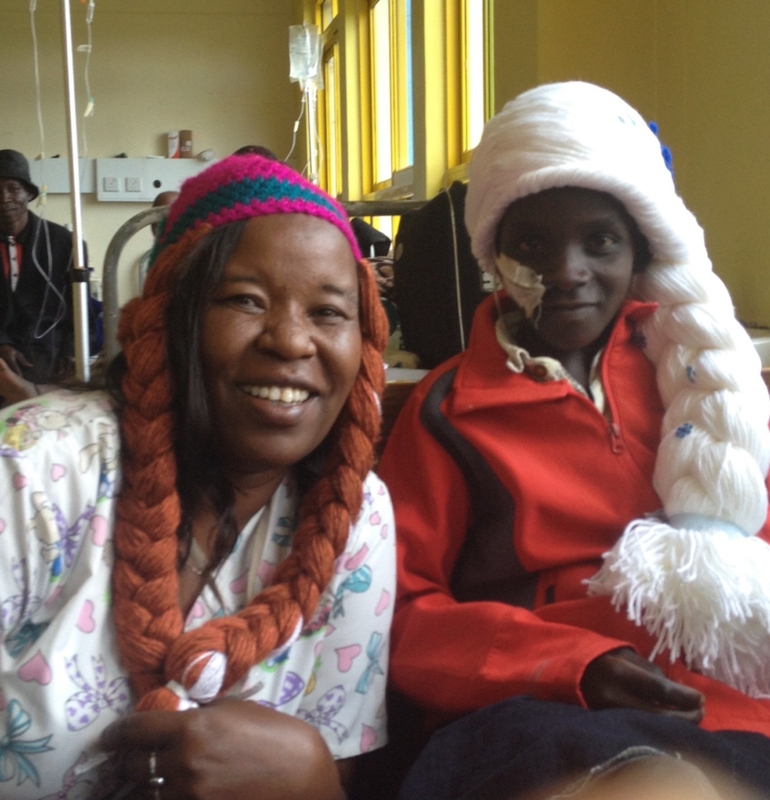 Jayne with an oncology patient, wearing Magic Yarn princess wigs. It is bittersweet that I am telling you about my amazing friend and colleague Jayne Kamau after the devastating crash one week ago, Ethiopian Airlines flight 302, that took her life and the lives of so many others. I first met Jayne at Moi Teaching and Referral Hospital (MTRH) in Eldoret, Kenya in 2008 and 2009 when I was beginning my journey as the Child Life Director of World Eye Cancer Hope charity (then Daisy’s Eye Cancer Fund). I was introducing the concepts, strategies and competencies of the Child Life Profession to a small interested group of hospital staff made up of counsellors, social workers, nurses and educators. We explored different aspects of child life work and the supports a child life specialist provides to young patients during hospitalization. Jayne participated in lectures, play and meaningful discussion about how child life would or could work within the existing public healthcare system in Kenya, Her interest and passion for child life was clear right from the beginning. Not one to shy away when trying something new, she bravely embraced the play-based approaches that make child life such a unique support for patients of all ages. I knew that she would be a child life specialist in Kenya. Day 4 of child life training in 2015. From Left: Regina Njoki, Cathy Cheruto, Phillister Wambeyi, Ernest Kirui, Martha Mwongela, Liz Kabuthi, Jayne Kamau. Jayne was one of the first to interview and take a position on the Sally Test child life team at MTRH in 2010. This was a big step, asking her to leave behind her position as a social worker to take a new role as one of the first child life specialists in Kenya. She took to her new role as a child life specialist with excitement and energy that was evident in the great work she did and in all her interactions with her patients and their families. Her colleagues also benefited from their time with her, since Jayne was so patient and supportive of helping her fellow staff. Whether it was problem solving a way to make a difficult procedure more manageable for a patient through comfort positions, or a listening ear and a cup of tea for someone who needed a different kind of support. It was beautiful to see Jayne’s passion for child life in her direct interactions with the children, their families and the hospital staff. As she rotated through the wards over the years, Jayne faced different patient populations with varied needs. She handled each new challenge with a smile, and an eagerness to take on new roles and offer diverse approaches for supports, depending on each individual child’s needs during their hospital experience. The children lit up when Jayne was with them, and she beamed with pride as the children’s coping improved even when facing the most difficult and painful procedures. Even when things did not go as hoped, Jayne remained positive and able to work on a better way forward next time to ensure the best for each patient. Jayne was especially skilled at explaining complicated diagnosis specific information about cancer to children and families, in simple ways they could understand. This ability meant more caregivers were able to make important decisions about their child’s care needs during cancer treatment. This lead Jayne and I to focus on building improved supports for children with retinoblastoma. Jayne’s child life work with the entire ophthalmology team in the eye ward built a strong foundation for the Kenyan National Retinoblastoma Strategy to base our work for patients with retinoblastoma and their families. Jayne, Morgan and Koech, sophthalmic nurse, stand outside the eye clinic during Morgan’s training visit in September 2018. 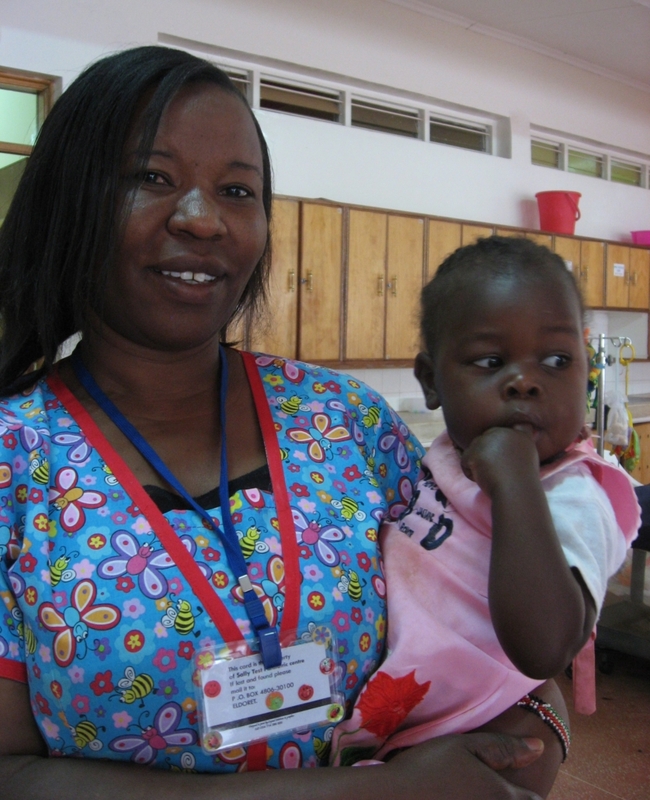 Jayne hugs a young patient receiving care at Moi Teaching and Referral Hospital and the Sally Test Pediatric Center. During our annual child life intensive trainings, Jayne excelled and demonstrated a deep understanding of the foundations of child life and developing her own skills. All while helping to build an incredible team of child life specialists and assistants. She embraced each new topic, certification and course, and what she learned was immediately included in her tool box of caring supports and approaches offered to her patients and families at MTRH. Jayne’s first international certification was in Infant massage. This certification led her to branch out to the NICU at Riley Mother’s and Babies hospital within MTRH, where she introduced child life, infant massage and more to our tiniest patients and their mothers. In addition to building child life within the NICU, Jayne worked with her child life colleagues to create weekly oncology support talks for families. Oncologists and child life specialists are present to answer parents’ questions and concerns about cancer treatment. 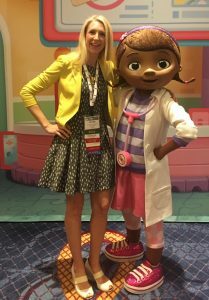 She and her team also developed legacy building for children facing life limiting diseases, and educational and engaging teen programming for older patients. By 2013, Jayne and the child life team had grown and developed more and better child life programming throughout the hospital. That year, Judith Duncan, professor (now retired) at Cambrian College in Sudbury, Ontario, joined me in delivering the Child Life Course “Children and Youth in Healthcare”, a course requirement for child life certification. Jayne enjoyed the learning and was at the top of the class. On September 7, 2015, our child life leaders gathered to sit their child life certification exam. That day, Jayne’s colleague, Liz Kabuthi, was the first person to train and certify as a child life specialist entirely in Africa. Followed by Martha Mwongela. Sadly, numerous communication problems and technical issues made delivering the child life certification exam in Kenya complicated, and impossible for most of the well-qualified child life team to complete. But Jayne never gave up on her dream of taking the exam and receiving her certification as a CCLS – certified child life specialist. She continued studying as we looked for the next opportunity to take the child life exam in Africa in the near future. 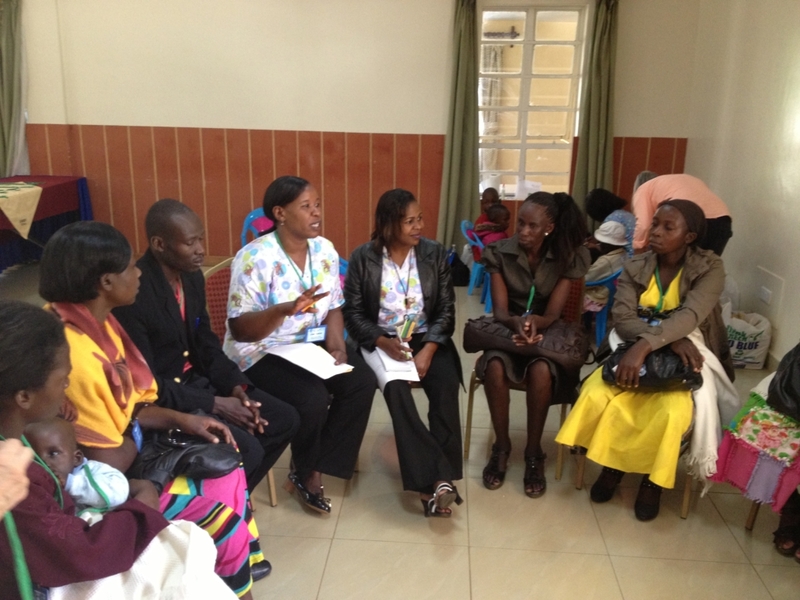 Jayne and Martha lead a session with parents at the 2013 Kenya National Rb Strategy Meeting. The MTRH Sally Test child life team participated in hosting the annual Kenya National Retinoblastoma Strategy meeting in Eldoret in 2013. Jayne was actively involved in the parent/family support programming, and we began speaking together about the specific Child life supports that patients with retinoblastoma and their families needed to be better supported during their care. After years of working on child life for retinoblastoma, we were ecstatic when our joint abstract was accepted for presentation at the International Society of Paediatric Oncology (SIOP) 2016 World Congress in Dublin. Immediately before SIOP, Jayne also presented at the One Retinoblastoma World meeting on child life supports for children with retinoblastoma in resource limited settings. 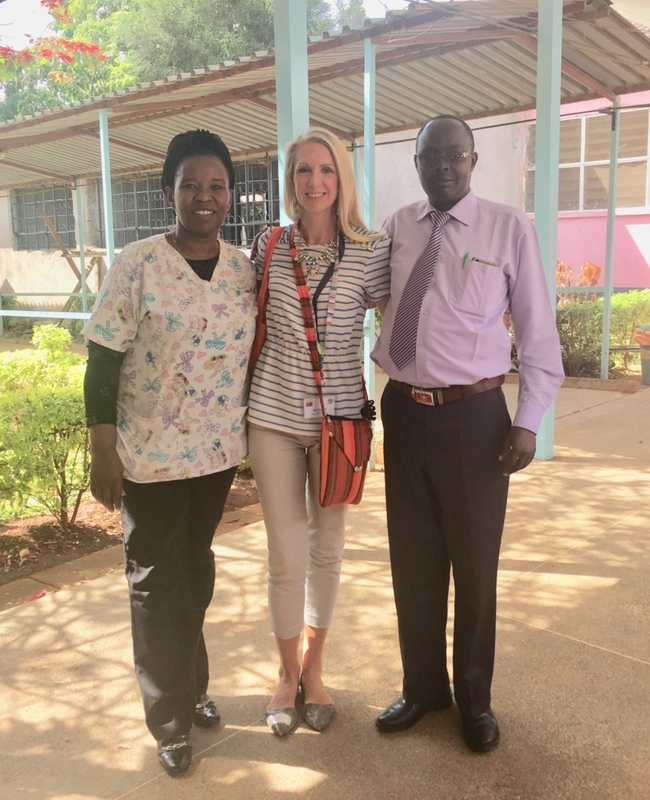 Jayne was an incredible example and ambassador of Child Life in Kenya when meeting colleagues and delegates from around the world who were involved in pediatric cancer care. All of our One Rb World participants were thrilled to meet her and hear her speak of her great work with retinoblastoma patients in Kenya. 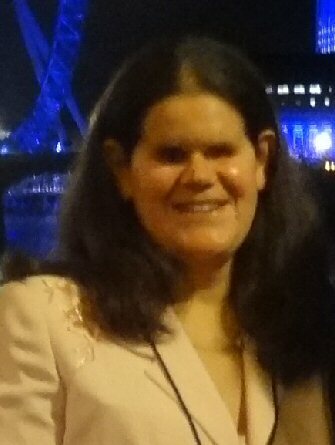 Presenting on child life supports in retinoblastoma care at One Rb World, Dublin 2016. While attending SIOP in Dublin, we began a deeper partnership with Bella Jaboma from Hope for Cancer Kids, Kenya charity in Nairobi. Jayne, Bella and I began some initial planning and hopes to expand sustainable child life into children receiving care at Kenyatta National Hospital and other centers in Nairobi. Our collaboration continued for the past two years, and expanded to include Liz Kabuthi CCLS, Jayne’s colleague in Eldoret. 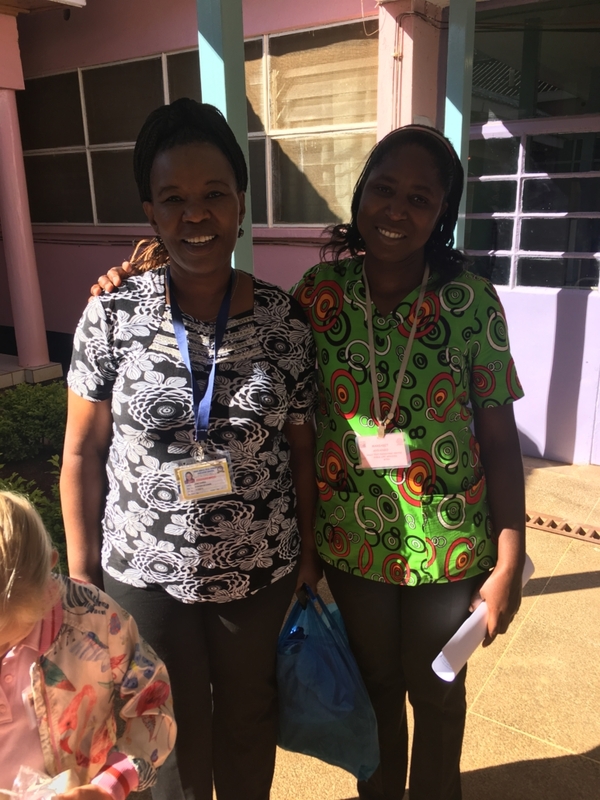 Liz worked closely with Bella at the KEHPCA (Kenya Hospices and Palliative Care Association) palliative care conference in November 2018, focusing on child life supports and legacy building in pediatric palliative care. 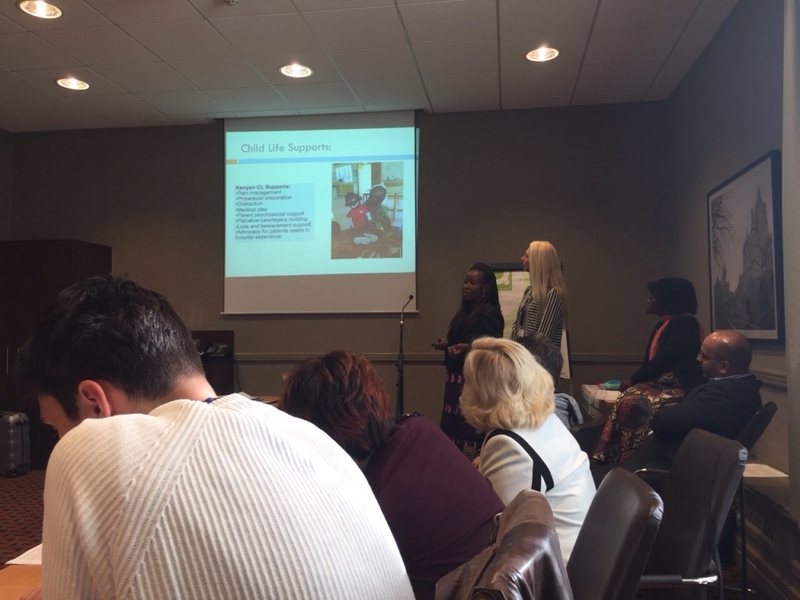 Right up until the start of the SIOP Africa meeting, Jayne, Liz, Bella and I spoke daily about their plans for presenting at SIOP Africa. As well as the collaboration of hosting child life practicum students together, between the Sally Test child life program at MTRH and Hope for Cancer Kids in Nairobi in September 2019. What we have achieved for child life in Kenya is a miracle. When I traveled to the country in 2007 with Abby White and Brenda Gallie, I didn’t know what lay ahead. We were a strong team: a survivor with perspective, a highly experienced retinoblastoma doctor, and a child life specialist skilled in supporting affected families. Abby was adamant that children should have access to quality psychological supports alongside vital life and sight-saving care. We trusted that we could find a way forward for child life in Kenya. We all invested our own money to make that trip happen. My work with Jayne and her team in Kenya would not have been possible without the commitment of WE C Hope. Funding for travel, training, certification and resources. And constant encouragement. We have worked with an absolute shoestring budget, but we have achieved so much. Jayne helped us prove that it’s local people who ultimately forge the biggest changes in a resource limited setting like Kenya. The goal of all these years of training has been to ensure the child life program is locally sustainable and staffed entirely by Kenyan child life specialists and assistants. Just this past year, all the child life team’s salaries have been included in the MTRH and AMPATH program budgets. Jayne and I dreamed big about child life and our hopes for more provision in Kenya and across Africa. We had made goals together for the next 5 and 10 years… For all the conferences we wanted to speak at together around the world to promote retinoblastoma-specific and sustainable child life. The places we wanted to go to together. The innovative research projects we wanted to undertake to improve psychosocial care for children with retinoblastoma and their families. We have much to discuss and plan to protect the long-term future of child life in Kenya, in the wake of our indescribable loss of Jayne and Bella. I, my colleagues in Kenya and internationally are grieving deeply, and it will take time for us to understand the path ahead for us. Even so, we already see three priorities for investment as we move forward, to strengthen the program for Eldoret, and ultimately for Kenya, and Africa. We are committed to continuing and expanding our training of child life specialists, through annual intensive training sessions and distance mentoring. We will continue to support the development of Sally Test Pediatric Center as an internship site at which individuals from across Kenya and Africa can train. 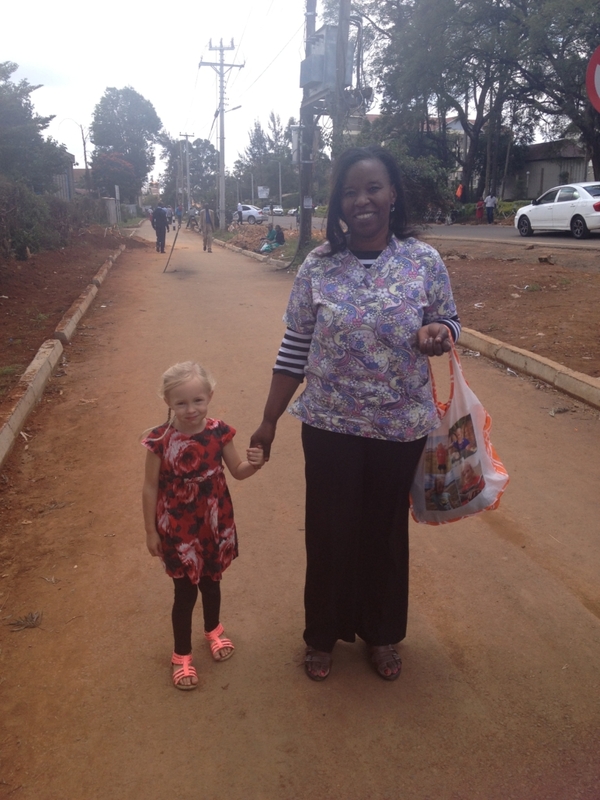 We will continue to work with our friends in Nairobi to bring Jayne and Bella’s dream of sustainable child life to Kenya’s Capital. Jayne and Maggie, her child life assistant, in the eye clinic, 2018. Jayne demonstrated that infant massage instruction is hugely valuable for the global physical development and mental health of young patients at MTRH, and for their families. Among many benefits, it reduces stress, helps manage pain, improves immune function and weight gain, and promotes sleep – all important for babies going through retinoblastoma treatment. Benefits for parents include better understanding of their baby’s individual cues, improved communication between parent and baby, relaxation and reduced stress. For this reason, it will be highly beneficial to train and certify all child life specialists and assistants who are not yet certified infant massage instructors. This will enable them to instruct parents on how to use infant massage specifically to support babies and young children going through intensive medical care such as eye cancer treatment. Shoe4Africa Children’s Hospital at MTRH is the first and only public hospital in East Africa dedicated exclusively to the care of children. It currently treats an average of 318 children every day. The hospital currently has no purpose-built outdoor play area to help support young patients through their treatment and recovery. Involving children in active play is the most effective way to nurture emotional recovery from trauma and anxiety. Play also helps to physically heal and strengthen young bodies after gruelling treatment. Our goal is to provide a fully accessible playground that embraces the varied disability needs of children with retinoblastoma, other cancers and medical conditions at the hospital. A place where they can escape the enclosed medical space for a while and rediscover what it means to be a child. Jayne wanted this so much for her families. We are working in partnership with Kids Around the World to make this playground a reality, and we need your support to make it happen! We must raise US$25,000 for the acquisition and construction of a large playground. Please see more information, and we will bring you further details very soon. Professionally, Jayne was an incredible leader in child life in Kenya. Personally, she was so, so much more. A friend, a sister, an Auntie to my children, a thoughtful voice and advocate for the needs of the child life team members. We were even closer after our time in Dublin, where we had the chance to room together, and adventure around a new city together. It is hard to believe with all the responsibilities and hard work Jayne took on, that she always had time for me, my children, her teammates. She was so caring and generous. A pocketful of sweet candy for the kids every day, or a small toy made in the Eldoret Market. Jayne will be deeply missed by everyone who met her, worked with her and loved her. Jayne’s son Ken and extended family mourn her loss, while celebrating her life. The entire Sally Test Child life team at MTRH Shoe4Africa pediatric hospital honor Jayne in their ongoing Child Life work. Jayne walks home after work with Fay, Morgan’s daughter. 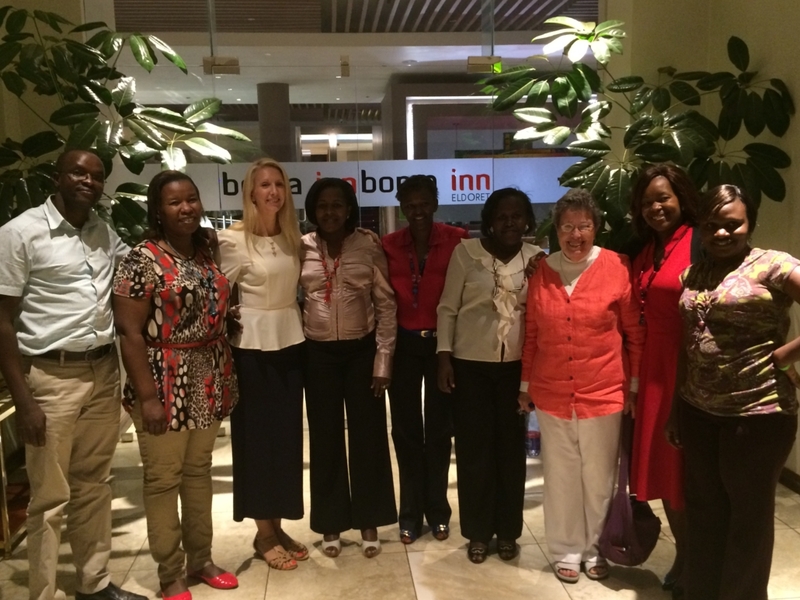 During annual training in 2015, the child life team gathers for a meal at Boma. 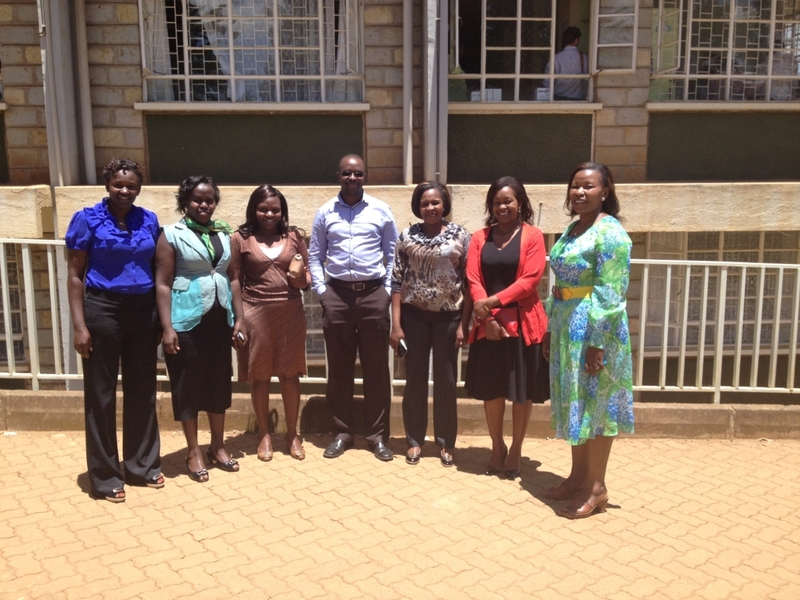 From Left: Ernest Kirui, Jayne Kamau, Morgan Livingstone, Martha Mwongela, Regina Njoki, Cathy Cheruto, Sarah Ellen Mamlin, Liz Kabuthi, Phillister Wambeyi. Abby’s father was diagnosed with bilateral retinoblastoma in Kenya in 1946. Abby was also born with cancer in both eyes. She has an artificial eye and limited vision in her left eye that is now failing due to late effects of radiotherapy in infancy. Abby studied geography at university, with emphasis on development in sub-Saharan Africa. She co-founded WE C Hope with Brenda Gallie, responding to the needs of one child and the desire to help many in developing countries. After receiving many requests for help from American families and adult survivors, she co-founded the US chapter to bring hope and encourage action across the country. Abby enjoys listening to audio books, creative writing, open water swimming and long country walks. Read the story of how WE C Hope began.